In July of 2016, Bruce and Linda Reid approached the Katie Ride staff, offering to host a Silent Auction fundraiser to benefit the Katie Ride and Katie Caples Foundation. The Reids would reach out to local businesses requesting the donation of items for auction and would also organize the details of the event as well as host on the evening. 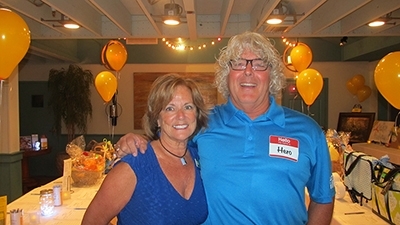 The Katie Ride staff and volunteers would provide marketing and promotional support but the real fundraising, donor solicitation and acknowledgments would be done by Bruce and Linda. Fundraising results would be credited to Bruce and Linda’s Katie Ride fundraising and the entire event would help kick off the Katie Ride fundraising and preparation season. The Katie Ride couldn’t turn down such an amazing offer and on December 6th the inaugural Keep Giving Tuesday Silent Auction took place at Slider’s Seaside Grill in Fernandina Beach. Just over 100 local businesses donated items for auction. And just in time for amazing holiday shopping, the community came out in impressive first time numbers to take part in this great event. All proceeds from the Silent Auction and Katie Ride benefit the Katie Caples Foundation’s organ donor education programs. Events like the Giving Tuesday Silent Auction also allow the Foundation to connect with the community and share the message of the importance and impact of organ donation. The folks at the Katie Ride asked Bruce and Linda to share some insight on just how they make events like this succeed. Bruce and Linda, tell us a bit about your cycling team the Big Bananas. Bruce: The Big Bananas friends & family bicycle team was designed -- actually hand-selected -- in 2010. The premise was to captain a much smaller, more manageable, highly motivated team. One that focused on fundraising. We're 30 strong. How long have you participated in the Katie Ride and in what capacity? Bruce: Linda and I met the Caples 11 years ago and immediately were sold on the ride and attracted to the foundation. Linda: We discovered right away that the Katie Ride was a premier event and suited not only our needs and met our expectations, but was an easy sell to our teammates. Bruce: Linda and I have evolved from riders to more of a leadership role, which for the past three years has included route coordination and management team participation. Linda: But we've never lost sight of the real mission -- to fundraise. That's top priority. What gave you the idea for a Silent Auction fundraiser? Linda: We have experience putting on a similar and successful event for the National Multiple Sclerosis Society, which annually kicks off NMSS Awareness Week. The idea of organizing an auction for the Katie Ride came naturally for us…and we were willing to try anything that would raise funds and perhaps inspire others to do the same. How many silent auctions have you done altogether? And how much have you raised in total? Bruce: In March we will tri-chair our fifth silent auction fundraiser for the MS Society. And, of course, this year was the inaugural event for the Katie Caples Foundation, which took in nearly $10,000. We've increased the proceeds for the MS Society by approximately $3,000 a year. Grand total so far is right around $55,000. What are the most challenging and rewarding parts of doing a silent auction to fundraise? Linda: The easy part is soliciting local merchants and business owners to donate to the event. The mere mention of the Katie Ride or the Caples opened the door for us. Amelia Island area stores and restaurants donated 120 items to this year's silent auction. And we are now up to more than 220 items for the MS event. The challenge? Getting friends, family members, co-workers, neighbors and supporters to the auctions. As with any fundraising event the turnout is the key to success. We're hoping the Katie auction will grow on islanders next December. Word of mouth is a key marketing tool. What other unique fundraising events or efforts have you used aside from the direct “ask” of friends, family and colleagues? Bruce: Our philosophy is that the Katie Ride each April and the Bike MS event every October are rewards for a year of fundraising. Fundraise first, ride second. That's what we stress to our teammates. We have passionate Big Banana teammates...and their fundraising for two great causes can get competitive, not just against other teams but among themselves. We love that. Linda: One of the nicest complements we have received, from the chapter president of the North Florida MS Society is that if Bruce and I are awake we are thinking about ways to raise more money. Bruce: The Caples shower us with kudos regularly but that's not why we stay involved. Our goal is to see the foundation grow and more people are educated about such an important issue as organ donation. And if we can motivate other riders, captains and teams to get behind our passion – wow! It can't get any better than that. What advice could you offer someone who is new to, or doesn’t like fundraising? Bruce: The old cliché is that if you don't ask then don't expect anyone to donate. Asking for a donation or support is not easy, trust me. Sometimes it is challenging. Linda likes cold calling on merchants for silent auction items whereas I prefer to ask people I know. We have our different philosophies about that. Linda: Fundraising can be made easier when you are passionate about the organization you are volunteering with...and the cause. Potential donors can sense when you are 100 percent behind the cause. We have personal stories to tell and we are always listening to others for their connection to the cause -- whether it's someone they know who has had an organ transplant, or someone they know who has been diagnosed with MS. Bruce: Putting on events that raise dollars is a natural way to go if you don't like one-on-one asking. Be as creative as you can with your events. Maybe put on a yard sale or ask a local café if you can put a “Donate Your Change” canister at their register. Look for businesses that are willing to assist you. There are plenty of merchants and restaurants wanting to get more involved with their respective communities. And Katie Caples Foundation is always willing to help you. Reach out to them with your ideas. What is the best part about finding creative ways to fundraise? Linda: When you find out how receptive people can be to your ideas. They want to get involved and just need some guidance and direction. Bruce: They want to be connected to a successful event, not to mention a worthy cause. Linda and I just happen to be "selling" great organizations. Linda: Don't be afraid to solicit help from friends and teammates. We certainly don't have all the answers. Advice is a great tool. Any advice or inspiration for team captains who are looking to grow their team’s fundraising efforts? You raised an impressive amount of money at this year’s Katie Ride Silent Auction, what’s your goal for next year?! Bruce: You're going to bring out the competitiveness in us. Our goal is normally simple -- do better and raise more than the previous year, or your last event. I'm not good at settling for anything less. That seems to work. And it makes perfect sense that if you improve the event and look for better ways to offer it, then an increase in fundraising will come naturally. Linda: Your strong effort can be so motivating and encouraging to others. It's contagious, and that's the bottom line. You want to see every team, captain and rider do similar things that will impact the bottom line -- meeting the fundraising goals and expectations of the organization. Bruce: We don't want to let anyone down. 29 South Restaurant, A Taste of Wine, ABC Fine Wine and Spirits, Amelia Adventures Guided Tours, Amelia Angler Outfitters, Amelia Hotel at the Beach, Amelia Island Culinary Academy, Amelia River Cruises, Amelia San Jon Gallery, Amelia Toffee Company, Amelia’s Treasure, Barbara Jean’s Restaurant & Bar, Barberitos Southwestern Grill, Barzin Bistro Wine Bar, Baxter’s Restaurant, Beach Diner, Bijoux Amelia, Bo N Mike’s Detail Shop, Brett’s Waterway Café, Bright Mornings Restaurant, Café Karibo, David and Susan Caples, Caribbean Breeze, Carmike Coastal Cinemas, Carolyn’s, Collection of Ponte Vedra, Cedar River Seafood, Champion Bicycle, Ciao Bistro, Cindy’s Nail and Hair Salon, Cold Stone Creamery, Color it Green, Concours d`Elegance, Crawford Jewelers, Current Running, David’s Restaurant, Debonair, DeNucci’s Soft Serve, Dome Healing Center, Don Patron Mexican Grill, Dottie B. Florist, Evelyn Talman, Fancy Sushi, Fernandina Beach Cycling and Fitness Center, Fernandina Beach Golf Club, Fernandina Fantastic Fudge, Festivals of Speed, Florida Adventure Sports, Flying Fish Fun, Four Seasons Bistro, Front & Centre, Gilbert’s Underground Garage, Go PC, Inc., Golf Club of Amelia Island, Green Turtle Tavern, Gretchen Williams Watercolors and Photography, Harbor Wear, Harris Teeter, Heron’s Swim N Sports, Home N Bed, Hot Paws Pet Resort, Island Vibe Surf Shop, Jacksonville Jaguars, Jacksonville Jumbo Shrimp, Jacksonville Zoo and Gardens, JW Frame Gallery, Kayak Amelia, Launch Printing & Promotions, Leddy’s Porch, Lindy’s Jewelry, Live in Flip Flops, Lollipops Quilt Shop, Luca’s on Centre, Magnas Full Body Salon, Monkey Barrel, Inc., Ms. Carolyn’s, Nana Teresa’s Bake Shop, Nassau Health Foods, Nassau Physical Therapy, Nervick, Mike and Nancy, Old Fernandina Historical Tours, Omni Amelia Island Plantation, Paisley Grace Designs, Pajama Life, Pearl Izumi Outlet, Pepper’s Mexican Grill & Cantina, Pet Supermarket, PK’s Bike Shop, Red Otter, Redbones Gourmet Dog Bakery and Boutique, Safe Harbor Seafood Market and Restaurant, Salty Pelican, Seaside Amelia Inn, Slider’s Seaside Grill, Southern Touch, St. Mary’s Railroad, Starbucks, Tasty’s, The Book Loft, The Crab Trap Seafood, Restaurant, The Golf Club at North Hampton, The Loop Restaurant, The Picnic Basket, Timoti’s Seafood Shak, Tony’s Brick Oven Pizza Restaurant, Townie’s Pizzeria, T-Ray’s Burger Station, Wadsworth’s, Walt Disney World, Well-Traveled Living, Willie Jewel’s Old School Bar-B-Que, Windward Sailing, Woody’s Barbecue. Just a few FUNDRAISING TIPS to get you started! Be sure to reach out if you need any help with your fundraising efforts. And thanks for deciding to be a part of the 2019 Katie Ride. We can't do it without you! 1. Donate to yourself: Get the ball rolling by making the first donation toward your fundraising efforts! 2. Start asking early: The earlier you begin asking people to contribute, the more you will raise. You can send personalized emails by logging in to our website. 3. Set a fundraising goal: Set your fundraising goal when you edit your personal fundraising page. Don’t be shy to ask again even after you reach your goal. You can set your goal from the Dashboard when you log in to our site. 4. Personalize your fundraising page: Include a photo, text, or even a video with your personal story about why you’re supporting our cause. You can personalize your page from the Dashboard when you log in to our site. 5. Share your page on Facebook and Twitter: People who share their stories on social media are twice as likely to raise more. Get creative with your posts and always include the link to your fundraising page. You can share on social media from your fundraising page or on the Dashboard when you log in to our site. 6. Say thank you: When someone supports you with a donation, send them a thank you note and tell them you appreciate their help. You can send thank you notes through the Messages area when you log in to our site.